Confession time! I’ve done something that I told myself I would never do. I blindly bought 18 polishes from an indie brand that was having a 50% off sale that I haven’t heard much of. 18 POLISHES! Only a fantastic sale could make me act that way. Do I have regrets? No! 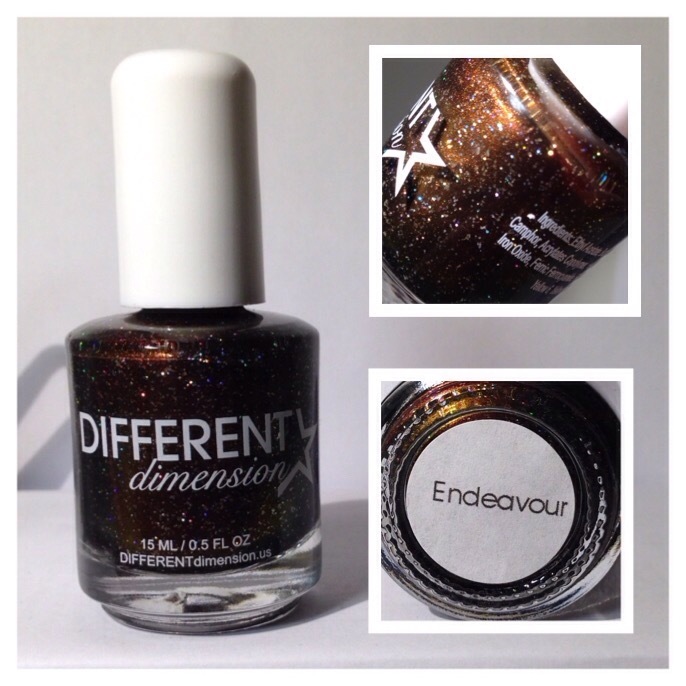 Endeavour was the first polish I tried from Different Dimension. I have never seen another polish like this before. This polish is a burgundy, orange and gold multi chrome. If that’s not enough to satisfy your polish cravings then add to that polish silver flakies AND holographic glitter! For the cherry on top Different Dimensions created a 8 piece collection called One Small Step and all 8 are multi chrome polishes with silver flakies and holographic glitter in them. Each polish is named after a US Space Shuttle or Mission. If you recall my last post was for a Revlon multi chrome. At most I could get two colors from it and barely see the blue and never the purple unless it was in the bottle. With Endeavor I had no trouble at all picking up all three colors. Even my pictures were able to pick up all three colors on my nails. Two coats and this polish was opaque.